The average strength of the garrison was 2,236 men. In the winter of 1838–39, the Dowager Queen Adelaide visited Malta for the benefit of her health. On 6 January 1838, Lieut W. R. Mends of HMS Rodney eldest son of Capt Mends of HMS Talavera married Melita, third daughter of Dr J. Stilton MD Surgeon RN. 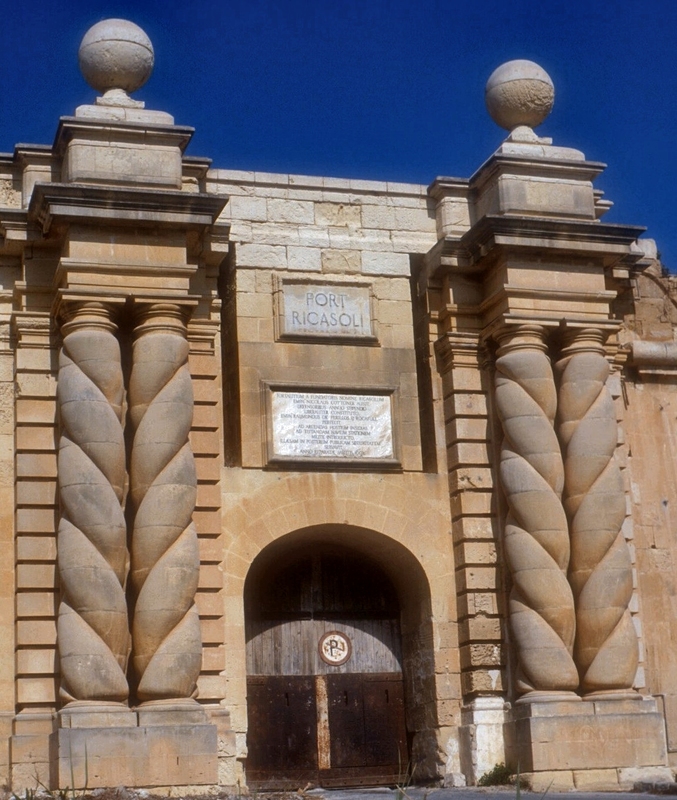 Fort Ricasoli Main Gate (reconstructed 1958) – the approach to the fort was by boat across the Grand Harbour. The main entrance was through this gate. In 1838, Fort Ricasoli was repaired so as to accept an infantry battalion and allow the whole of Fort Manoel to be given up to the Quarantine Department. The Ordnance Department prepared the barracks at Fort Ricasoli for occupation by two Field Officers, 12 officers and 402 men. On 6 Dec 1838, Dr V Azzopardi petitioned the Rt Hon Viscount Palmerston, Secretary of State for Foreign Affairs, for the post of Medico di Porto and Polizia, which had been vacated by Dr Luigi Gravagna. Azzopardi had served in the British Army as an assistant surgeon. In 1807, he had accompanied the second expedition to Egypt under Maj-Gen Fraser MacKenzie. He had also served in Sicily under Lt Gen Stuart, in Spain under the Duke of Wellington and in the Ionian Islands under Lt Gen Thomas Maitland. At the end of the Napoleonic Wars he had settled into private medical practice at Constantinople. TNA:WO 17/2144, Returns of the General and Staff Officers of the hospitals attached to the forces in Malta (1 January–1 December 1838). A list of all the officers of the army and Royal Marines War Office 30 January 1838.